I had recently received a review copy of Blender Game Engine – Beginner’s Guide written by Victor Kuller Bacone. It is a 200 plus page book from Packt Publishing. The following is my review of this Blender 3D related book. Firstly, I will like to state that, with the exception of having created 3D contents (modellings/texture creation) for realtime-based engines for several clients, I have no prior background in actual game creation whatever. As such, my review will be purely from the perspective of a newbie in this area. Generally, the book is fairly easy to follow. By the end of the first chapter, one should have acquired a fair understanding of how interactivity can be injected into a 3D environment. In this chapter, the Logic editor, which controls game interactivity, is introduced with a short exercise. At times, the written instructions given in the book is not entirely clear. However, the condition is not insurmountable. This is mainly due to the fact that much of the steps are accompanied by screenshots, making it possible to follow the process in spite of occasional non-clarity in written instruction. Not much is talked about with regards to 3D content creation for game. This book covers the actual game creation itself with emphasis on injecting interactivity, animating the game characters and game logics. If you are seeking information on 3D modelling/texturing for game creation, you will perhaps have to rely on a different resource. On a positive note, by excluding 3D content creation which is a fairly different area of game creation, the delivery of the teaching content in this book is actually pretty straightforward. 2. how to make objects interact as if they are physical obstacles. 3. how to create a basic game with different levels of gameplay. On another positive note, there are also significant information about how the completed game can be published and distributed. The book shows you how you can distribute your game as a standalone distributable. Additionally it also show you how the game can be displayed and play via the internet. My personal opinion is that a Game Engine (such as Blender’s) need not be just for game creation only. It has the potential for creating other applications as well. For example, it can be used as an interactive instructional platform for explaining and teaching purposes. 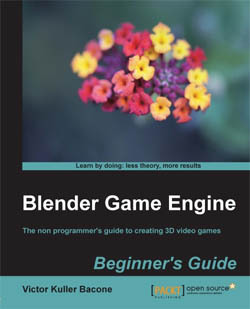 As such, I view books such as Blender Game Engine – Beginner’s Guide as not just for people who want to create games. Potentially, persons seeking to inject interactivity in various types of application involving 3D environments may find such a book of use. As of this writing, teaching materials pertaining to the Game Engine for Blender 2.5/2.6 series are scarce. Blender Game Engine – Beginner’s Guide is perhaps one of your best bet for learning this aspect of Blender, the powerful opensource 3D content creation software.